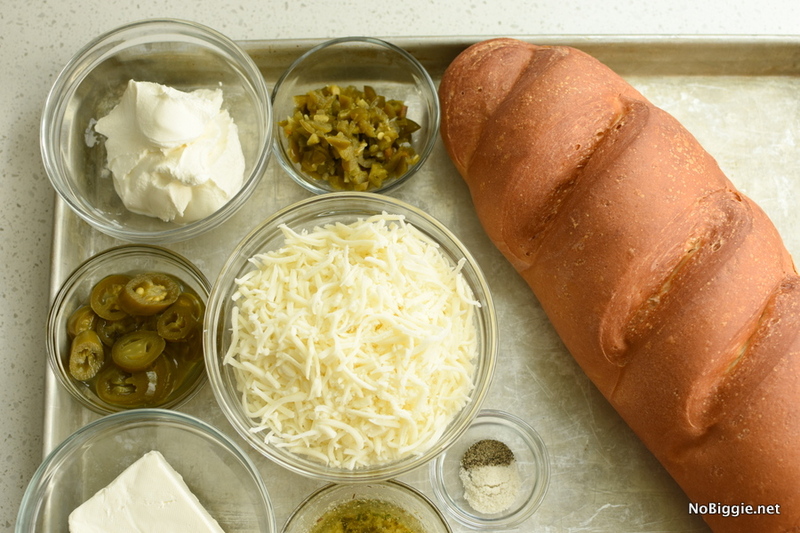 The ultimate cheese bread…Jalapeño Popper Bread! With game days and tailgating in the days ahead, how about a spicy take on the cheesy garlic bread we all love. 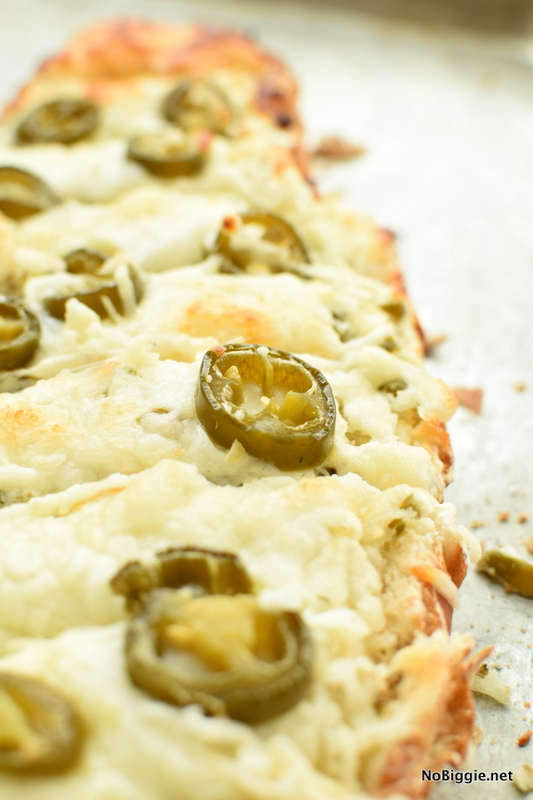 If you like pickled jalapeños, you know the “not too spicy jalapeños but just enough spicy” to give this bread a little kick, you will love this Jalapeño Popper Bread. 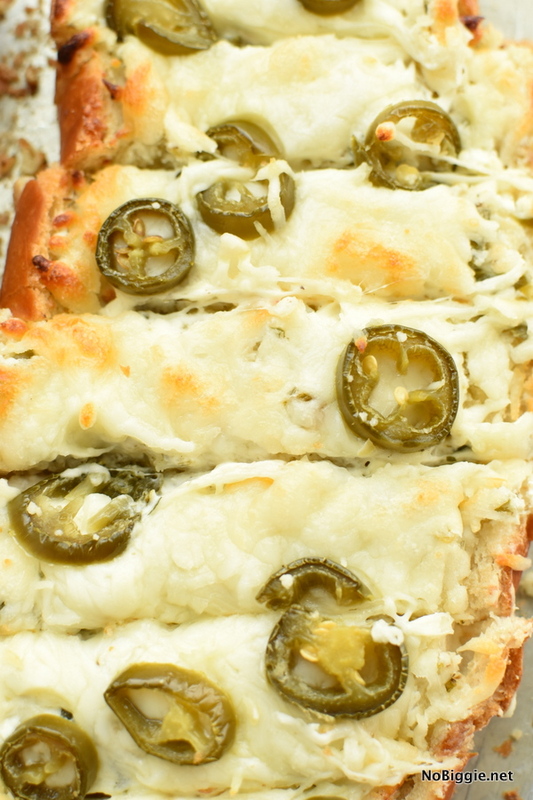 Think jalapeño dip + garlic bread happy together in one cheesy bread. Here’s the ingredient line up. I love to cover a sheet pan with foil for easy cleanup. 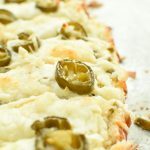 There are chopped jalapeños in the spread mixture, in addition to sliced pickled jalapeños on top after you add loads of grated mozzarella cheese. My son who normally doesn’t love spicy food, loved this Jalapeño Popper bread. 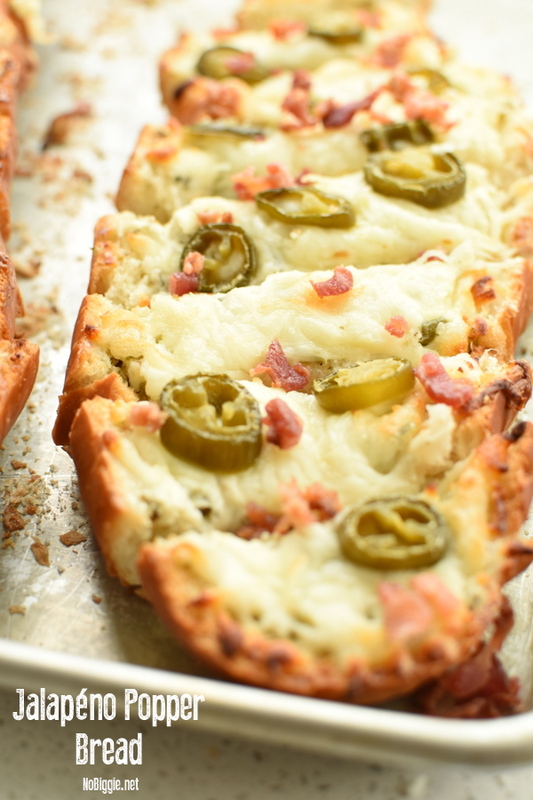 The best kind of party food...spicy cheesy Jalapeño Popper Bread. Line a large sheet pan with parchment paper or aluminum foil. Chop half of the jalapeño slices. Reserve the rest to place on top. Cut the bread in half lengthwise, then place both pieces cut side up on the sheet pan. Brush both pieces with softened garlic butter. Bake for 5 minutes. In a medium bowl with a hand mixer, mix together the cream cheese, sour cream, chopped jalapeños, salt and pepper. Remove the bread from the oven. *If you'd like to add cooked bacon crumbles, you can add them to the cream cheese mixture AND or sprinkle the top with bacon. Spread both pieces of the bread with the cream cheese mixture and grated mozzarella cheese. Arrange the reserved sliced jalapeños on the top of the cheese. Place the bread back in the oven for 6-10 more minutes, to melt the cheese. Remove from the oven and place on a cutting board. Let cool for a few minutes. *See the recipe for homemade garlic butter, OR just use melted butter with 1 teaspoon garlic powder. We love to gather with our extended family and do a appetizer only dinner. Have you ever done that before? It’s always a hit. So many appetizers…so many options and everyone is happy. It is basically like SuperBowl Sunday, it’s the best! 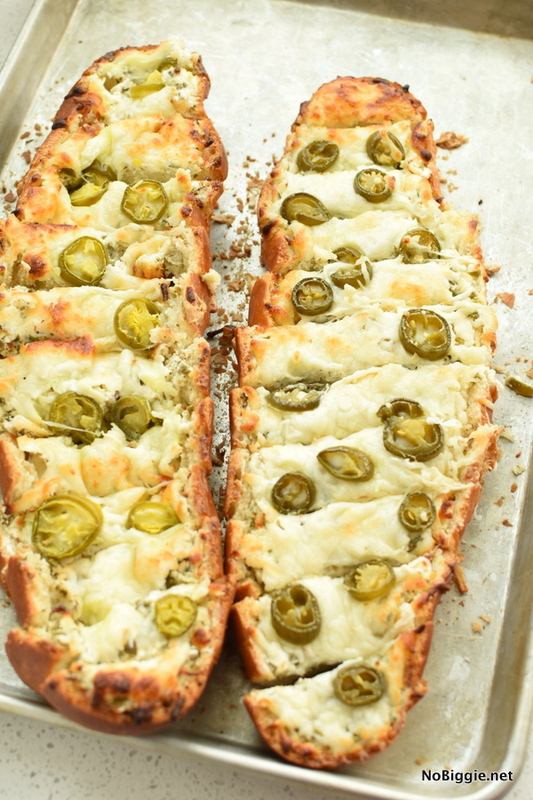 This Jalapeño Popper Bread would be perfect for something like that. You could even make most of it ahead of time and bake it when you get there since it has such a short bake time. After just a few minutes in the oven, the cheese will melt and when it’s a little golden in spots, you will know its ready. Warning this bread is addicting…you will want to have the rest of your dinner ready to go when these come out of the oven, or this will BE YOUR DINNER. Ha!